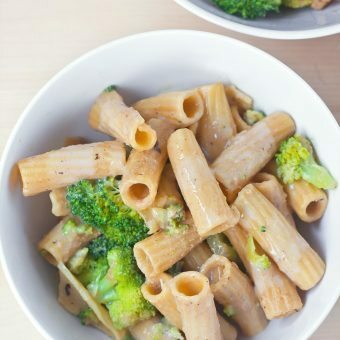 Because this upcoming month is National Pasta Month, here are five of my favorite healthy pasta recipes to add to your weekly dinner rotation. October may be National Pasta Month, but for me—an Italian—every month is pasta month. My love of noodles in all forms can be credited to watching my Italian grandmother when I was a child. 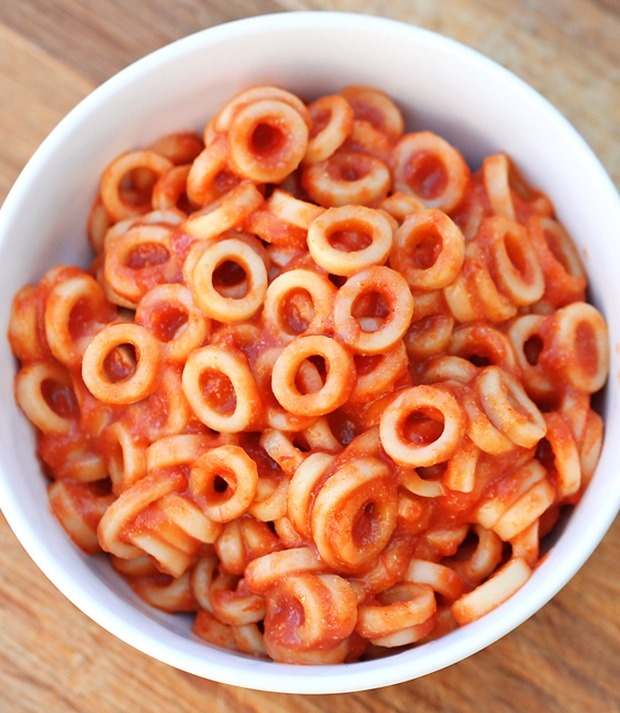 She loved pasta so much that there were mornings where she literally ate it for breakfast! 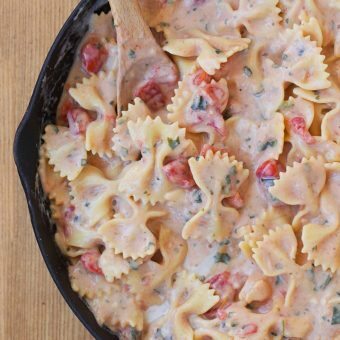 Do you have any favorite pasta recipes that you find yourself making again and again? When I’m not sure what to make for dinner, I will often simply boil up some pasta and toss it with leftovers or chopped-up onion, vegetables, garlic, and olive oil, for a quick and easy meal that works well with whatever I have on hand and doesn’t require an actual recipe. It’s really hard to go wrong with pasta! 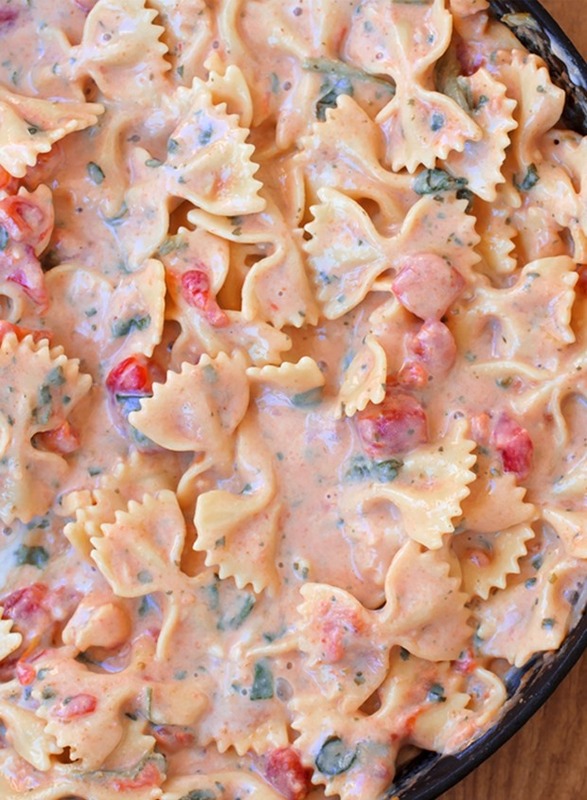 Creamy Spinach Tomato Pasta – Ready In 25 Minutes! 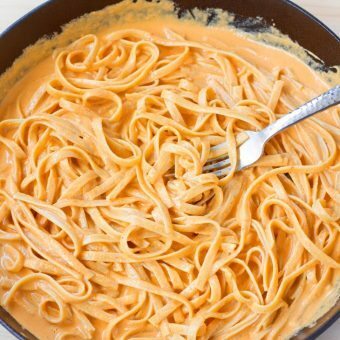 Vegan Pasta Alfredo – Ready In 20 Minutes! Thanks for the recipe suggestions! Can’t wait to get back into the kitchen after my travels! 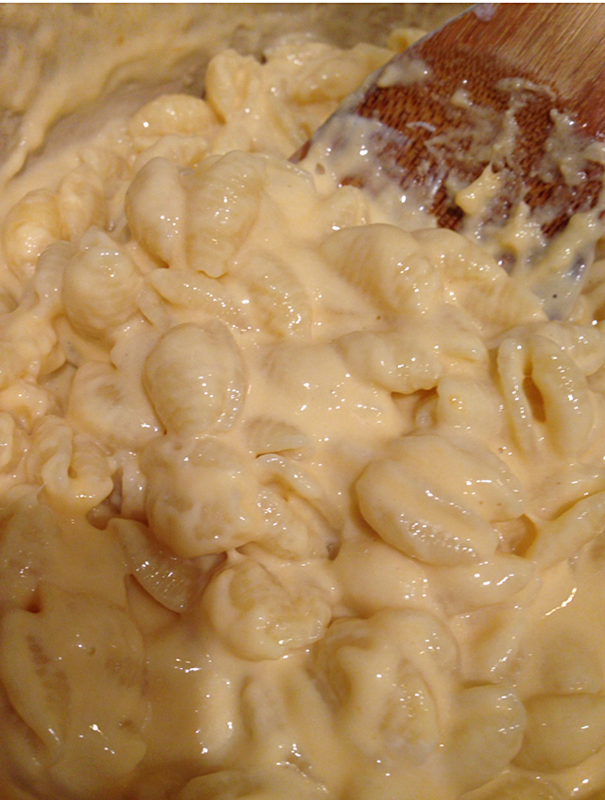 I LOVE your Greek yogurt mac & cheese recipe. I have made that many times. It is delicious. Love all your recipes and recommend your blog to whoever I talk to. Pasta, oh, pasta. I’m not going to lie and say that I wouldn’t die for pasta, but it’s a dish that I really love to learn recipes for! Pad Thai may not count as a pasta dish, but it is one of my favorite meals that involves noodles! 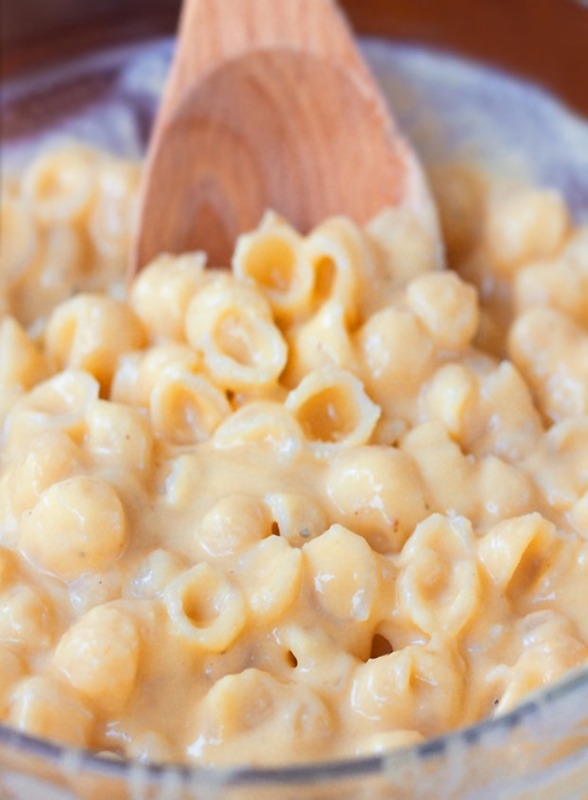 😀 Anyways, these dinner recipes look perfect, especially your Greek yogurt macaroni and cheese! YUM! 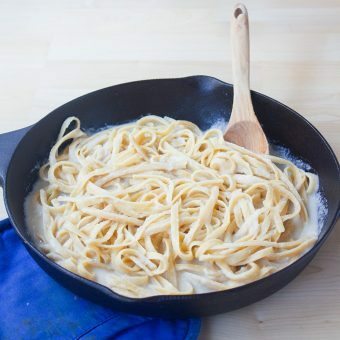 I think I’ll have pasta week and enjoy one of these each night. They sound fantastic. 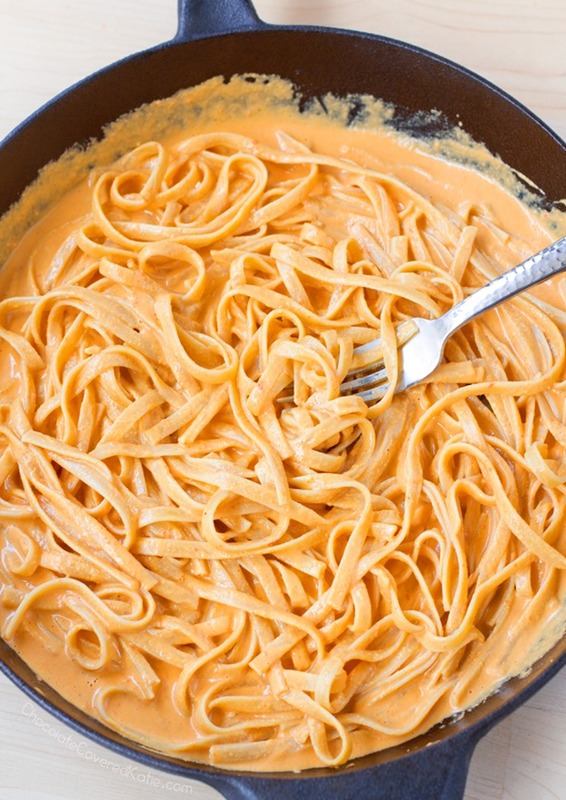 My super-favorite is Katie’s avocado alfredo sauce recipe! It’s wonderful with coconut milk, coconut oil, and fresh minced garlic. Yum!